Evelyn Rós had the most liked content! Evelyn sat up straight in her seat as the shuttle made its seemingly long approach to the Starbase 118 spacedock. The approach took roughly five minutes, but it seemed like an eternity. She was so excited to get on with her cadet cruise, and be assigned her first duty station, that the slow pace of the shuttle seemed to take an eternity. Evelyn watched from the viewport as the opening into the massive chasm grew more vast, taking in every detail of the Starbase. She could see the command towers, which were quickly receding from her view as the shuttle closed on its destination. Evelyn Rós was a Cygnian from Cygnet XIV. She had light brown hair that framed the creamy skin of her round face, offset by her dark green eyes, that were slotted like a cat's. She had pale freckles over the bridge of her nose, which was small and impish. Her ears, which Evelyn herself didn't care for, were a bit large, and stuck out from beneath her hair. Her lips were plump with no adornment, and ended in very small dimples. Her frame was lithe, her arms slightly short for a humanoid, but this was hard to tell due to her height, which was somewhat shorter than the average Cygnian. She was used to looking up at most people, and it didn't bother her that she wasn't very strong. Evelyn was sure-footed, no doubt because of the extra balance provided by her thin tail, and was quick and agile, which was helpful in her physical training during the Academy. For four years now, Evelyn had waited, sometimes not so patiently, for this moment. More importantly, for the next step, when she would be assigned to a starship. She wanted to seek out new discoveries on the edges of space, and help to increase the knowledge of all peoples of the Federation. The small fear that she would be assigned to a station instead of a ship throbbed in the back of her mind, but she quieted it. She would worry about that once she finished her cadet cruise. The cadet who sat next to her, a Benzite female in a yellow uniform, leaned over toward Evelyn. “What Academy are you coming from?” She asked. “Earth.” Evelyn replied happily. “Are you not Cygnian?” The Benzite asked. Evelyn was used to being recognized as a Cygnian, and quickly. It was probably because of her tail. She was also used to the questioning attitude that some people took when she told them that she attended Stafleet Academy on Earth. There were much closer campuses than the San Francisco location. “I am, but I spent some time in the Sol system as a child, and I requested to go to the Earth campus.” “Ah. Are you in the medical field?” The curious cadet asked. “No, no. I never had the passion for healthcare, I'm in sciences. What about you?” Evelyn said. “I am an engineer.” The Benzite said simply, in her formal way. Most Benzites seemed to have the same strangeness when it came to speaking with people, like they were almost apologetic for each question. Evelyn paid it no mind. She didn't mind talking to the cadet, but her mind wasn't in the conversation. She was focused on what she was going to do while she waited for her next test to start. “Look, we're landing!” Evelyn said, excitedly. The shuttle didn't so much land, as it connected with the docking tunnel, which provided the ingress path to the station. She listened to the pilot speaking with the station authorities, and watched as the pilot looked over the panels of his station. Of course, he wasn't controlling the shuttle at this point, the station was guiding the shuttle now. Within moments, the pilot stood, and gave them them the “OK,” to disembark. Evelyn almost jumped to her feet, her tail brushing against the Benzite as she turned to gather her pack, and had to restrain herself from running to the exit. She turned back to the other cadet who was quickly falling behind, and waved. “Nice meeting you.” Evelyn was almost bursting to see Starbase 118's top of the line science facilities. She wanted to see the stellar cartography holodisplay, which was supposed to be three decks in size. She wanted to observe the astrogeology labs and study the robotics lab. Most importantly, she wanted to get her hands on the astrophysics equipment. Her hopes were dashed in moments, when she reached deck 550, and the officer at the entrance to the astrophysics lab told her she would not be authorized at this time. She had to complete her training first. It was almost as bad as being told that she was getting ejected from Starfleet. Annoyed, Evelyn found herself wandering the Promenade of the commercial sector, impatiently waiting for the cruise to start. She didn't want to waste time here, looking at tourist attractions. 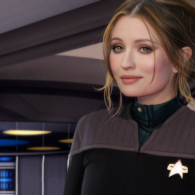 She wanted to immerse herself in the day to day activities of the Starfleet officers who were stationed here, and learn something during her wait. Evelyn's tail whipped left and right as she walked in irritation. Absentmindedly, Evelyn stepped into a bar she found called Keal's Pub. She ordered a Saurian Brandy and sulked in her seat at the bar. She just wanted to get out there, into the blackness of space.